Best known as the Saducismus triumphatus (1681), Joseph Glanvill’s book on witchcraft is among the most frequently published from the seventeenth century, and its arguments for the reality of diabolic witchcraft elicited passionate responses from critics and supporters alike. Davies untangles the intricate development of this text and explores how Glanvill’s roles as theologian, philosopher and advocate for the Royal Society of London converge in its pages. 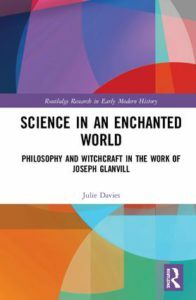 Glanvill’s broader philosophical method and unique approach to the supernatural provide a case study that enables the exploration of the interaction between the rise of experimental science and changing attitudes to witchcraft. Julie Davies is a Research Assistant at the ARC Centre of Excellence for the History of Emotions at the University of Melbourne. For details, please see the publisher’s website. This entry was posted in Books. Bookmark the permalink. Both comments and trackbacks are currently closed. #ISIH2019 will take place 5-7 June 2019 at the University of Queensland.